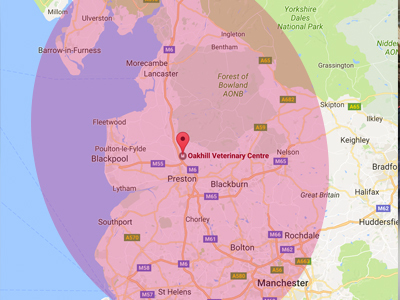 Our ambulatory Equine Vets cover the North West from as far up as Kendal, down to Liverpool, including Preston, Fylde, Blackburn, Blackpool, Lancaster, Chorley. Across the North West, from as far up as Kendal, down to Liverpool, our large team of experienced equine vets provide the highest standard of affordable ambulatory veterinary care, from routine procedures to emergency appointments. Appointments can be arranged during our extensive opening hours. An addition we ALWAYS have 2 vets oncall for emergencies 24/7, 365 days a year. Clients and those who are referred to our equine clinic from other veterinary practices, come from all over the North West, to access our outstanding facilities. Call 01772 861300 to book your appointment.